Whether it’s Monday, normally dubbed as “International Chest Day”, or any other day of the week that you are in the mood to build some serious mass, this is the video for you. 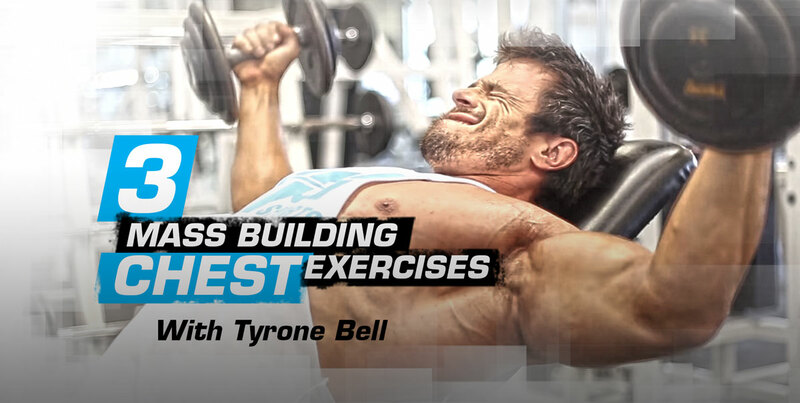 BPI Athlete and owner of Legion Training, Tyrone Bell, takes you through his 3 Chest Mass Building Exercises that DO NOT require barbells. 1) Hammer Dumbbell Press (with a Twist): Laying on a flat bench, put your dumbbells up as if you were performing a normal “dumbbell chest press”….only this time, at the top, twist the dumbbells and squeeze the pecs causing a deeper contraction in your chest. Deeper contraction = greater stimulus towards mass development. 2) Incline Dumbbell Flyes with a Load Stretch: Start in your typical dumbbell flye position, only this time, hold the dumbbells out in the bottom stretch position for 1-2 seconds on each rep.
3) Incline Dumbbell Press with a Shortened ROM: When performing an incline dumbbell press, stop the dumbbells 1-2 inches from your chest at the low position, and stop just short at the top of the press. This will increase the stress in your upper pecs. Slowing down the movement will give your chest even more stimulus.